Are you ready? After we have learned about the crochet hook and the yarn, let's move to the crocheting basics. But before we go on, you must know how to make a slip knot. Slip knot or slip loop is used in crochet to attach the yarn to the needle. It's the first step in crocheting chain and is counted as the first st. 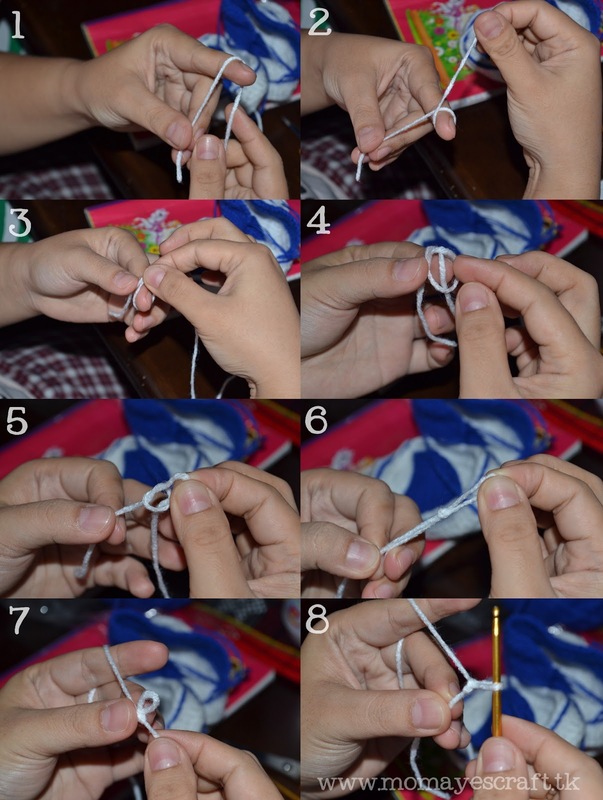 So this is a step by step demonstration in making a slip knot. Please click on the photo to enlarge. This is the easiest way I can teach you how to make a slip knot. And if you already know how to make a slip knot then you are now ready to make chains. dami kong to do list and learning crochet is definitely on my list. surely be coming back if i have the materials and time. :) thanks for sharing! thanks for the tutorial.. ang galing! I wish I had the patience to learn.Pagkakakitaan pa man din. I am a poor crafter. I didn't even learn that during highschool. i remember my brother told me that their teacher taught them how to crochet when he was in elementary. how i wish our teacher taught us this too. i know how to embroider but i don't know how to crochet, huhu.